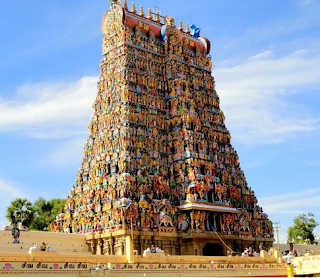 Historic hindu temple also referred to as Meenakshi Amman or Minakshi-Sundareshwara Temple. Meenakshi Temple is located in Madurai city of Tamil Nadu.Which is one of the oldest and most beautiful temple.The temple is included in the wonders of the world due to its texture.It has also been kept in the list of most clean temples.The temple's sanctum is considered as old as 3,500 years old. This temple is dedicated to Lord Shiva and Goddess Parvati. So if you are planning a religious journey then this temple will be a good experience for you. This beautiful temple spread over 14 acres and the height of the temple is 160 feet.In order to enhance the beauty of the temple and to protect it is surrounded by high-rise walls.There are two other temples in the premises except Sundareshwar and Meenakshi,and there are many other temples where Lord Ganesha,Murugan,Lakshmi, Rukmani,Saraswati Devi. There is also a pond in the temple 'Porthamrai Kulam' which means gold lotus pond. 165 feet long gold and 120 feet wide lotus is exactly the middle of the pond. 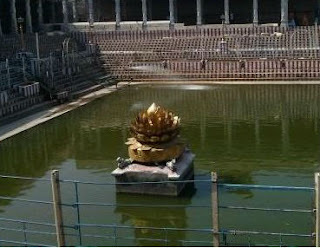 Devotees believe that Lord Shiva's residence is in this lake. Inside the temple, the mythology of Lord Shiva is written on the pillars and on the eight pillars, the Goddess Lakshmi Ji statue remains. There are 4 main entrances (Gopurams) which are connected in the temple. There are 14 gopurams in this temple in the multi-storey district. Apart from this, there is a very big and beautiful place in which there are 1000 pillars engaged.The lions and elephants that have remained.The roof of the temple is very colorful. There is a temple of Singhvasasini Mata Purnagiri on the eastern edge of Dhartanuma rocky hill, which is approximately 3 thousand feet high above sea level, which is calculated in its principal benches. The mandatory temple with marble stones is always filled with the scent of red garments, suhag-stuff, climbing, offering and sunlight. The navel of the mother is covered with stone whose lower end has reached the Sharda river. This place is located near the statue of the goddess and devotees pray and pray. As they enter the temple, the passengers remain amazed by the colorful polothine panels and red chairs tied on the railings of iron pipe mounted to protect the passengers on the mountain peak from several meters away. These colorful red-yellow ripos, witnessing an unwritten contract between Goddesses and their devotees, proclaim glory of faith. On completion of the wish, there is also the recognition of the temple's philosophy and gratitude and the opening of the lump of rag. Aamer's fort located near Jaipur is a testimony to the glorious history of Rajputs. When they settled in Ammer, they built a magnificent fort on a hillside.The same fort is known today as the name of Ammer Fort.Aamer valley is called the valley of flowers. As soon as entering the valley, the ramparts of the fort, the dome, the turret and the gateway start to appear. The mountain on which Ammer Durg is located is a beautiful lake in front of it. It is called Mawtha Sarovar. There is a way to go to the fort at one end of the lake. Where a beautiful villa is built. It was built in the time of King Jaysingh. Its name is Dulgaram Bagh. There are some small rooms in the garden. There is also a small museum there. In which the foundations of the search area are displayed. These include ancient sculptures, inscriptions, shilpattas and coins etc. Lotus Temple notable for its flowerlike shape. Delhi is known for its historic places and buildings.Many architectural wonders are located in the city. Among them,this white beauty called Lotus Temple is a major attraction.Lotus Temple is one of the most famous tourist destinations in Delhi.Lotus Temple in delhi has been built by an Iranian architect Firiborz Sahaba and has been funded by Randhapur of Ardishehr of Sindh.It is at the end of 7 Bahai temples in the world. People of any religion can go inside this temple and pray. People sit in the hall and meditate. Central dome of temple It has a dome in the center, which is covered from the outside marble petals.The roof of this dome is an interior scene. Garden of temple There is a very beautiful garden in a part of this beautiful temple which has many types of plants. No picture is allowed inside this templeBahai Dharma prohibits the display of any kind of images. If you have plans to come to Mumbai and you want to spend your time in something special way, then Mumbai's Hotel,which named Four Seasons Hotel I believe you would like to spend your holiday here or a good quality time with your partner.This hotel located 1/136, Doctor E Moses Road, Worli, Mumbai, Maharashtra 400018.You can enjoy your stay with comfortable rooms,outdoor pool,spa and fitness centre. Popular tourist places to visit in karnataka Karnataka option is best.If you are thinking of outing with a family.The sight of the lush green hills of Karnataka becomes even more beautiful after the monsoon and the mood of the weather remains pleasant.There are so many options for going from Nature to Adventure. Name of 4 beautiful places best for destination wedding in Great India . Whenever it is a matter of Destination Wedding,most of the people start thinking about Goa,Jaipur and why not these are most beautiful place of India.But there are many more places in India where you can make your wedding even more beautiful and memorable.Let's tell you about these places. Do you know there are countries in the world, you will not need a visa to travel. Yes you can visit these countries without applying for a visa.Wake up in the morning,Go to the airport and buy tickets and reach the country.Visas will not be needed.Although many countries have given the facility of visa on arrival for Indians, in some countries e-visa is available.We are telling you, in which countries of Indian passport holders you can go for free visa or in which countries you can get the facility of e-visa or visa on arrival. In Visa on Arrival, some countries seem to have some fees, while in some countries this facility is free. Western Rajasthan, where desert is mine and the rest of Rajasthan especially the eastern and southern Rajasthan have unique look with feel and identity. There are scenes of beautiful lakes and nature's boon-rich scenes, lush green hills and wildlife sanctuaries. 'Mount Abu' is such an unique place which is not only the 'hill station' of Rajasthan, also called 'Desert-State', but also to fulfill the lack of 'hill station' for Gujarat. Site ". This hill station, situated along the Gujarat border in Sirohi district of Southern Rajasthan, is situated at a height of 4 thousand feet. Mount Abu used to be a 'summer resort' of the members of the pre-royal houses of Rajasthan, who had been overwhelmingly hot. Later it was also called "Hill of Wisdom" because many religious and social beliefs associated with it have also made it known as a religious, cultural and spiritual center.